Since the 1970s Australian governments have supported choice in schooling, providing public funding to non-government schools as a way of ensuring that all schools have at least a minimum level of facilities and resources for all students. School choice policies underpin pluralism in society. They allow families with different ethnic, religious and cultural identities to choose a school to best meet the needs of their child and their own values, within a frame of common social values. Parents’ right to choose the kind of education to be given to their children is included in the Universal Declaration of Human Rights as well as the International Covenant on Economic, Social and Cultural Rights which commits its signatories “to have respect for the liberty of parents . . . to choose for their children schools, other than those established by public authorities . . . to ensure the religious and moral education of their children in conformity with their own convictions,” with the proviso that that education must conform to minimum standards laid down by the state. In the research literature, choice is associated with stronger incentives to performance, creativity, innovation, diversity, efficiencies and higher student achievement. These benefits of choice are stronger when combined with school autonomy and accountability, both to the parent body and the wider public. The freedom of students and their families to exercise choice in schooling is one of the most demanding forms of accountability for Independent schools. Schools need to remain competitive to survive and consistently meet high parental expectations for the development of students. By providing government funding to support choice, governments then have policy levers available to pursue the public interest in quality schooling by imposing accountability requirements on staffing and teaching programs. Various objectives are sought by governments in adopting choice policies. The overarching objectives are to recognise the religious beliefs and educational values of parents in a diverse society, and to ensure quality education for all students. Independent schools reflect Australia’s social and ethnic diversity, offering choice for young Australians to be educated in schools with different cultural, religious and educational philosophies. The diversity of the sector, illustrated below, is representative of the diversity of the Australian population as a whole. 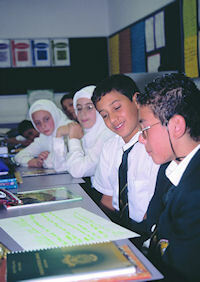 **Other includes special schools, international schools, indigenous schools, and community schools. In the Independent sector, parental values shape the school while the school is held accountable to the community it serves as well as to the wider public through commitment to the national goals for schooling, as set out in the Melbourne Declaration on Educational Goals for Young Australians. Public funding is a mechanism for making choice compatible with the wider public purposes of schooling. There is no single basis for parents’ choice of a school for their children and a great many studies point to the various factors that contribute to their decision. A consistent theme in research is that people place a high value on the availability of choice, even those who do not actively choose to send their child to a school other than their local one. While the conventional view of the basis for choice may be that it is a matter of income and social class, there is a sound evidence base showing that factors such as parental education and occupation, values and attitudes, and community and culture are more important than social class and wealth for families choosing non-government schools in Australia. Independent schools attract students from all income groups, although the sector has a lower share of enrolments from low and middle-income families compared with the Australian school student population as a whole. However, contrary to popular belief, not all high income earners send their children to Independent schools, with about half of such households sending their children to government schools. 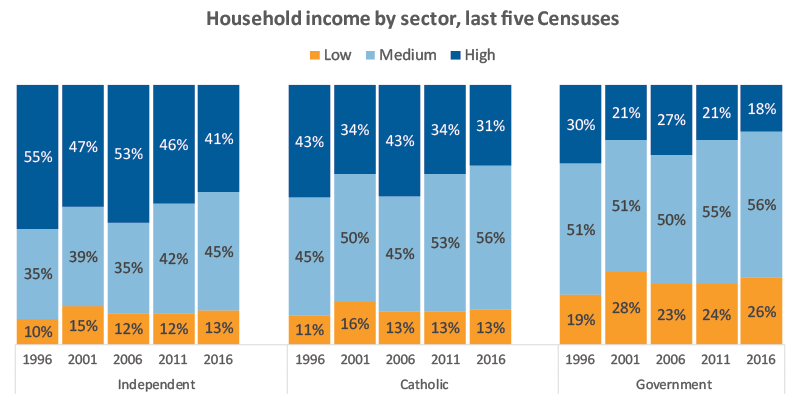 The data from the Australian Bureau of Statistics (ABS) Census of Population and Housing shows that the growth in the Independent sector over the last few decades has come from households across all income brackets, especially the middle income bracket. In choosing an Independent school for their children, parents are influenced by a variety of factors, including religious affiliation, broad academic outcomes, quality teaching, a supportive caring environment, the physical environment and facilities, the content of the curriculum, quality leadership and the range of extra-curricular opportunities. A survey conducted for ISCA (2008) showed that among the most important factors influencing parents’ choice of Independent school – educational excellence, good teachers, a supportive caring environment, good facilities and education philosophy – what parents want above all is for children to have a well-rounded education with a strong emphasis on learning life skills. The 2008 ISCA Research Report, Factors Affecting School Choice, is available in PDF format.